Acceptance. It’s what happens when we consent to a change in our lives, a new reality. What does acceptance mean today in the world of senior living? 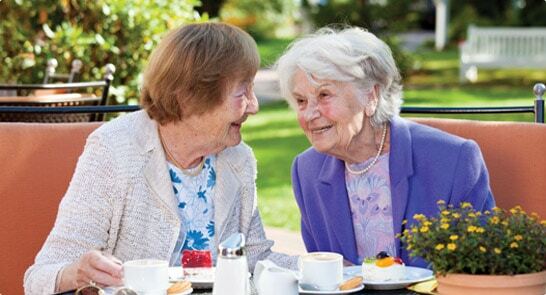 For the millions of people who live in senior living communities across the United States, acceptance came to be through two avenues, acceptance by choice or acceptance by circumstance. As I look back on my own life, I realize that when we are of sound mind and body, we often make plans for our future lives based on the belief we’ll have acceptance by choice. I grew up in a home where my parents were caretakers to elderly parents of their own. Both my parents vowed to never repeat this reality of forced round-the-clock caregiving. It can take years off someone’s life, and they didn’t want to do that to their own children. So when the time came that they needed care, they were on board, right? After all, those many years ago, they had chosen to accept the need for care down the road. At the time, the conversation started when I was witness to the formation of modern senior living communities. Built with senior community in mind, many of these buildings feature neighborhood-style areas where the residents socialize together with their peers and family, while maintaining their own living space. As circumstances change, one can easily transition into a greater level of care while still maintaining independence. In theory, it sounds perfect. But, for my parents of today, the idea of leaving the home they had created was met with reluctance. The conversation continued as both parents became physically disabled. Eventually, one parent was diagnosed with dementia. Choice was still there as the other parent began to assume a larger caregiver role. While choice was there, acceptance was not. Last year, the caregiving parent suffered a fracture in the spine after a fall. Again, one would assume the next step was apparent. However, acceptance still was not there by either parent or my siblings. The message of choice went unheard. My parents accepted home care, but the one parent—now clearly a fall risk—continued to be the main caregiver. One year and a fractured pelvis later, acceptance by circumstance was thrust upon them. Neither can care for themselves or each other, and sadly, with different medical needs, they are now living in separate senior living facilities due to bed availability during this emergent time. This has led to unhappy parents living a life they did not intend and siblings trying to make the best of the situation. How do we as an industry try to change the mindset of seniors to choose transition over forced acceptance? Do we change the messaging from acceptance by choice to prevention of the inevitable? For both personal and professional reasons, I would love to know the answer and look to others in the senior living care game to weigh in. Let’s share the stories and successful messaging so we can all better assist our seniors toward acceptance by choice.